This print, surprisingly, refers to the Criminal Lunatics Act of 1800, which required the indefinite detention of mentally ill offenders. 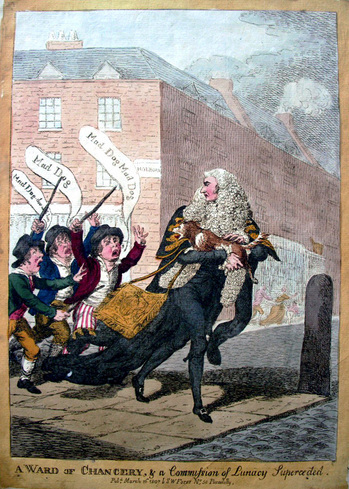 It was passed thanks to chief counsel Thomas Erskine (1750-1823), who argued that an actor named James Hadfield (1771/72-1841) was insane when he tried to shoot King George III during a performance at the Drury Lane Theatre. Erskine convinced the judge that Hadfield had only pretended to kill the King because the actor wanted to die and knew he would be killed for the attempt. Since the laws of the time had no provision for holding or treating criminals who were found to be insane, a bill was rushed to the House of Commons so that Hadfield would not be set free. No more than four days after the trial, “A Bill for Regulating Trials for High Treason … and for the Safe Custody of Insane Persons Charged with Offenses,” also known as the Criminal Lunatics Act was passed. Erskine was made Lord Chancellor in the Ministry of All the Talents, although he had no background for the office and only lasted fourteen months in the position. He is seen here rescuing a dog that was being beaten by a group of boys. This actually happened in February 1807 and Williams finished the print a few weeks later, referencing Erskine’s history of rescuing mad men and mad dogs.